We use water bottles, tumblers, and "sippies" daily at our house. Even though we rarely go anywhere, we need hydration throughout the day in our office, school room, workshop, and garden. Our almost 4-acre property has lots going on, and getting a drink without hassle is important to us! 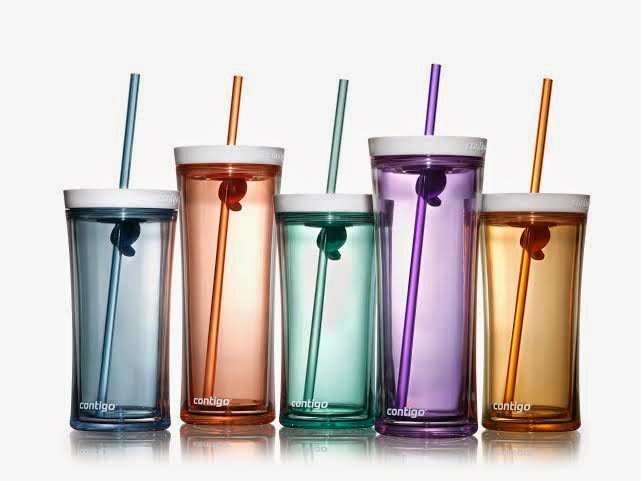 While we have enjoyed some of the other offerings from Contigo in the past, we also really enjoy drinking from straws. Not only do straws have benefits to your teeth (keeps them from staining as much, for example), they are easy for the kids to drink from. The new Shake & Go tumblers fit our lifestyle very well. We also use water flavor enhancers and powdered mix-ins, so having a to-go cup that lets us keep using these products -- and easily -- is a must. One unique perk of the Shake & Go is the lid. When the straw is OUT, it seals the hole so that you can shake without leaks or messes. If you need to transport liquids without spilling, just take out the straw. (I also like that the straw has a part at the end so that you can't pull it out without removing the lid.) With the straw in, it is NOT 100% leak proof, but it does a pretty good job and much less mess than a typical straw in a cup. To learn more about these fun, functional, and stylish new tumblers, and get more info on their “Make it, Shake it, Take it” process, be sure to check out the Contigo website. Wanna Save? Get a 20% discount on your Contigo purchase with code shakeitblog through June 30. Wanna Win? Enter to win (4) 16 oz. Contigo Shake & Go Tumblers by using our Rafflecopter widget below. You have until May 23rd at 11:59 pm EST. Open to U.S. residents 18+. a Rafflecopter giveaway *Samples received to review. Opinions are our own.